Do you know that your children will eat only what you have available in your house? Dr. Fuhrman’s book says Kids will eat what is available in his book Disease-Proof Your Child: Feeding Kids Right . If you stock your pantry with healthy food instead of processed food, they will eat it! without coaxing, coercion, etc. A child who refuses to eat fruits and vegetables and only eats chocolates, chips, cookies and french fries, does because all of these junk food is available. It is our fault as a parents that children are eating candies, pizzas, donuts, sodas and chips. Children will not starve to death if you do not provide them what they want. I really think that to get your kids to eat healthy food, you just have to be a little bit creative, sneaky and very patient. if you take away junk food and spend some time for your kids to get them to eat healthy foods, then you will save them from a lifetime of difficulty. Creating healthy food habits has it own rewards, you will see them more energetics, more focus and more even-tempered. 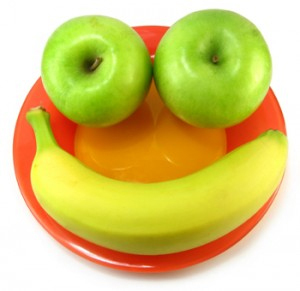 You can try some simple and fund ways to get kids to eat healthy foods below. First, do not buy more chocolates, candies, chips cookies. Fill the refrigerator with a variety of fresh fruits and vegetables and meat, poultry and fish instead of stoking with sugary and processed foods. Create snack packs made from cut up fruits and veggies and cheese. Also, maintain fruit in a bowl where it is simple to see and easily reachable for children. You can use cookie cutters in place of using just cutting cookies. Children love the foods like sandwiches which are cut into different shapes and sizes. Prepare food in the which is liked by your children. For the whole family, Children love the inevitability of family meals and parents also have an opportunity to reconnect with their children. Improving the healthy eating habits puts the pressure on you to eat a well-balanced and well-proportioned meal. Also, recent study has shown that food tastes of kids are considerably associated to foods that their mothers liked and disliked. Let your child see you order or prepare a fresh salad rather a burger and fries may encourage child to do the same. It is time for health action, Mom. The absolute best personalized baby gift you can give your child is healthy lifestyle from infancy to adolescence. If you really want to take action of your child health I suggest you Kid approved meals e-bbok. This great book and manual will help you start creating good food habits and recipes for your kids. Kid approved meals by Christine Steendahl: includes 13 Weeks (5 days per week) of Tried and True Breakfast and Lunch Ideas that your kids are sure to love; along with Categorized Grocery Shopping Lists For Each Menu. We will introduce a variety of easy recipes that will inspire creativity in the kitchen. This book really help you gain variety and organization for mealtime. The menus inside this book will help you remember that certain kid friendly foods are available, as well as provide you with creative new ideas to try.